December 20, 2016|Posted in: Holidays and Seasons, Let's Eat! My hubby and I both have December birthdays. A few years ago our grown kids had the idea to have a combined birthday and Christmas cookie party! It’s been a fun family tradition ever since. 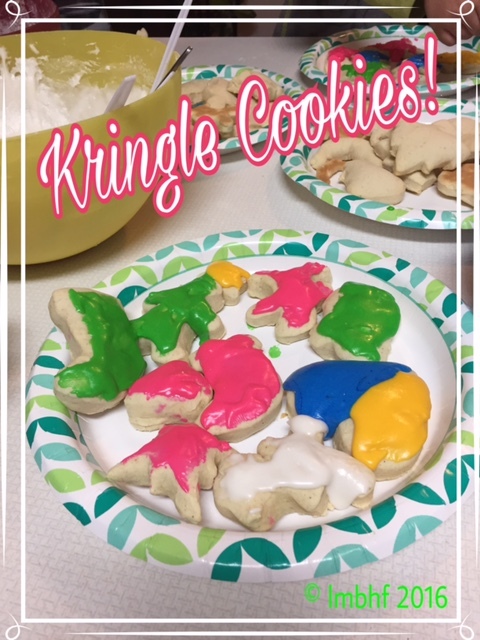 This year our cookies were very colorful and we had lots of fun! These cookies are cake-like and slightly sweet. Their sugary sweetness comes from the frosting. 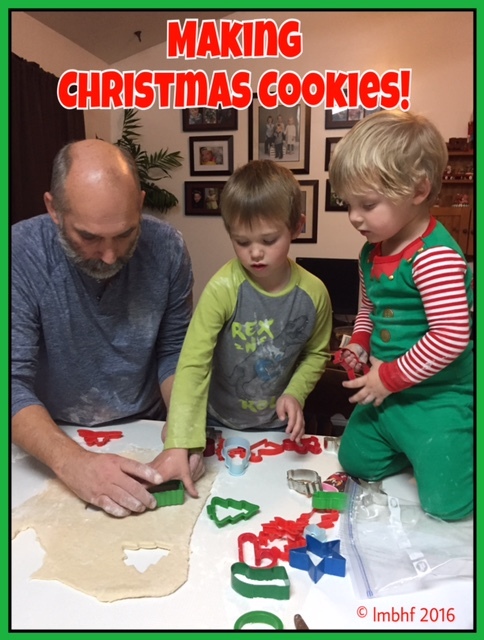 You and your family can make some Kringle Cookies and have your own Christmas cookie party! 2. Lightly grease a large cookie sheet. 3. In a large mixing bowl, mix sugar, egg and sour cream until well blended. 4. Add salt, soda and cinnamon and mix well. 5. Slowly add flour, mixing it in until the dough is no longer sticky. 6. Place the dough on a floured surface and use a rolling pin to roll it out until it is about ¼ inch thick. 7. Use cookie cutters to cut the dough into shapes and place them in the cookie sheet. 10. To make the frosting mix powdered sugar, butter, milk and vanilla until well blended. If necessary add a little more milk until frosting reaches desired consistency. 11. Spread frosting on the cooled cookies. « Gift Tags to Print and Color!